Any forex traders in here? I just had a moving average cross buy signal on the USDJPY. Anyone long? - are you talking about a long term position hold here? Seems to me that it surely wouldn't be a trade shorter than a half day or day that you're talking about here. - what kind of signal are you seeing? chart hi/lo, support/resistance, MACD, ???? I'm very new to Forex myself so I'm VERY interested in your and other's responses. I am also new to Forex myself. My timeframe is 1-10 days depending on the market condition. Do you also trade USD/JPY? I use a combination of moving averages, MACD, and fibs. Do you also trade USD/JPY? Well, I trade anything that moves - I think that's my problem! I've heard that newbies should focus on ony one pair to learn what moves the market and how prices act, and especially to see the trends. I am experimenting alot with my strategy. I found somethings that work most of the time but I need to find other things that compliment this. My strategy has evolve and will keep evolving until I get consistent result. Right now I am using Bollinger bands, EMA's RSI and Stochastics. They work fine together (most of the time) back testing. Now I am testing it AGGRESSIVELY on different time frames to see which one it work best on. I think you need to pick a timeframe you want to trade first then work on a strategy to trade that timeframe. The opposite approach you are taking forex gump will conflict with your trading style. This uptrend support line extends from the second test of the 87.00 double-bottom, which occurred in January, and essentially defines the uptrend that has been in place since price surpassed the double-bottom peak around 94.60. I am not sure if you noticed but these posts are from 2006. On Monday it reached at the 114.50 level area and then on Wednesday increased up to 116.50. There is side exchange fluctuations within the 114.50 - 116.60 area. Recommencement of side exchange fluctuations within the 114.40-116.60 region can be expected. But its chances are bad. Last week the lower fluctuations limit fell to 114.40. But there wasn’t less than 114.00 limit decline. The upward trend up to 116.60 says about high probability of overcoming of this limit as well. These side exchange fluctuations limits overcoming will lead to the next two development (20%). There is a downward trend to the 113.40-114.00 area. The course decline can continue in case of fixing below 114.50. In that case the nearest decline target of the 113.40-114.00 region will easily be reached during the week. After that the correcting rebound can arise again (40%). What is a "side exchange fluctuation"? Japenese Government is trying hard to tackle economic problems. Current week started with yen strengthening against other major currencies. After release of monetry data, which was not good enough to satisfy investors, yen lost its value. Whereas USD gained value after very good U.S jobless claims report came this morning. If u look at today's chart, u will have no doubt in USD strength and JPY weakness. Fundamental analysis is strongly favoring bullish trend. With the test of following indicators, technical analysis is also in favor of bullish trend. 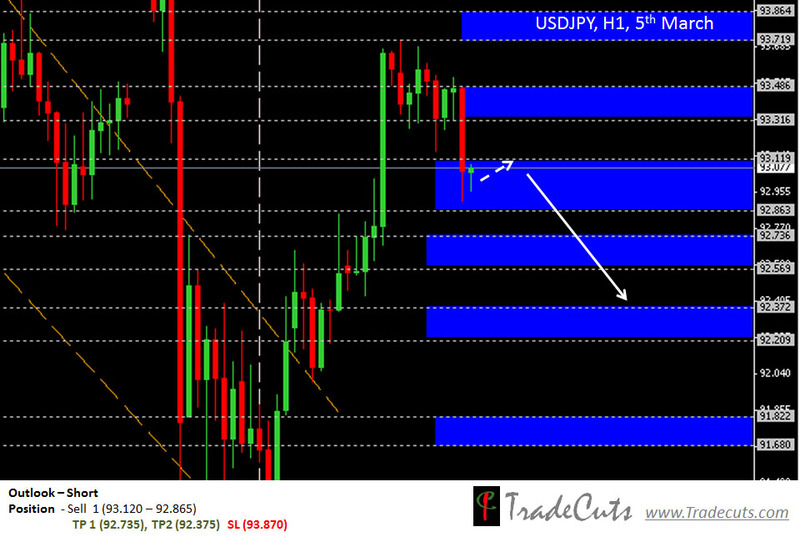 USD/JPY has already crosses 90 and it is now ready to test resistance zone of 90.40 to 90.50. I know this is three weeks old, but I have a different take on the whole USD/JPY situation. The USD/JPY is not going to keep up its recent bullish trend because it was pretty much agreed by Shinzo Abe to set the target at 90 and now we are passed that and it was also mentioned by Bank of Japan Governor Masaaki Shirakawa that the Yen has declined more than intended. I can't seem to find any recent developments as to any target adjustments by Abe even though I was informed by some Japanese sources that the target has been altered to 100 after taking into account the recent free fall. It still appears to be overvalued to many in the Japanese press and government. But all of this is puzzling to me given that we are heading into a gathering of G20 members over the weekend and they will not be happy about the Yen's decline. I have a variant view right now of what is going to happen to the USD/JPY. I mean the long term technicals for the greenback are sound and the Yen should appreciate again back to the long term support level of 90 as it will come under pressure from other countries that have been hurt by Japanese exports. The USD/JPY recent bullish trend is set for a pull back I strongly believe. USD/JPY traders r on the hold and waiting for final statement from G20. Many investors r expecting strong criticism on Japan. But many strong sources r denying that japan will face any serious cricism. Because not only japan, but many other countries also took part in "currency war". So Japan is in a better position now to answer incase it is singled out. British finance minister said that contries shouldnt use currencies as a tool of economic warfare. Even though there were a little less than expected data release from U.S, it is interesting to see that dollar has gained strength against most of the major currencies today. Housing starts figures show 8.5% drop for the month of january whereas expected figures were better. We can see a slight increasae in building permits and housing market. All these things have almost no effect on usd/jpy and the pair is still in consolidation mode. I think this pair will be out of the current situation after the news release of new BOJ governor. I'm long since november 2012! My performance is amazing. I'm actually using the turtle trading strategy. Tuesday began with the Dollar showing signs of weakening against the Japanese Yen. The week started with slow moves for the JPYs, as pairs remained sideways. Currently price action and support and resistance zones still withholding,indicating Strong JPY. 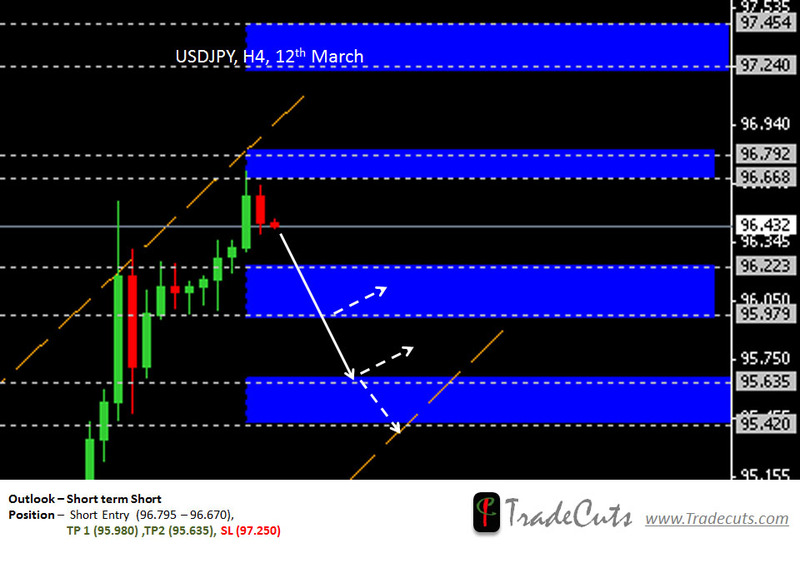 Here is our outlook for USD/JPY for today. which will provide short term Short trades for intraday traders. So take your pips when you can. But don’t get over ambitious with shorts as they may not last long. The Nikkei is being driven by the effects of the devaluation of the Yen. The Nikkei rose 275 points or about 2.5% on the last Monday in February 2013. In the first week of March it actually hit a 4.5 year high by reaching the 11968 level. There are a couple of reasons why the Japanese index is soaring. Firstly, Japanese exports are now cheaper. Secondly, Yen based stocks are gaining due to inflation. Developed economies such as the United States and those in the Euro zone have increased their demand for Japanese exports due to the lower prices and so profits for these Japanese firms rise. I agree I did post an article here about the Yen appreciating against the dollar, but the market is so erratic that it has forced me to consider another view. It was a view that I had already approved of since so many Wall Street analysts seemed to think so. Nonetheless, I did raise a lot of valid points in that USD/JPY article. Although,FX Street might turn out to be right they did not highlight the right reasons why. And I'll give you those reasons now. I do get a lot of stuff right too. Why has the Yen been volatile? The BOJ Rate was unchanged and even the Asset Purchase of 76 Trillion Yen stayed the same last Thursday. It was stressed that "aggressive monetary easing" will be pursued by the BOJ, but this still did not change the decline in the Yen that followed. I've changed my opinion about the trajectory of the Yen, but why do a lot of speculators not share the same view. The USD/JPY slid because investors are fed up with the lack of action on the part of the BOJ. Another reason is that although it is true that investors are well aware of Kuroda's intentions, he is not confirmed yet. Moreover, the Kuroda factor has already been discounted for by traders. Kuroda not being confirmed yet with two weeks to go until he takes office means that there is a risk for investors and this will be a near term issue for Abe's plans to weaken the country's currency. Nonetheless, as confirmation day edges closer you will see the USD/JPY surge upwards and a lot of speculators trading the currency pair. 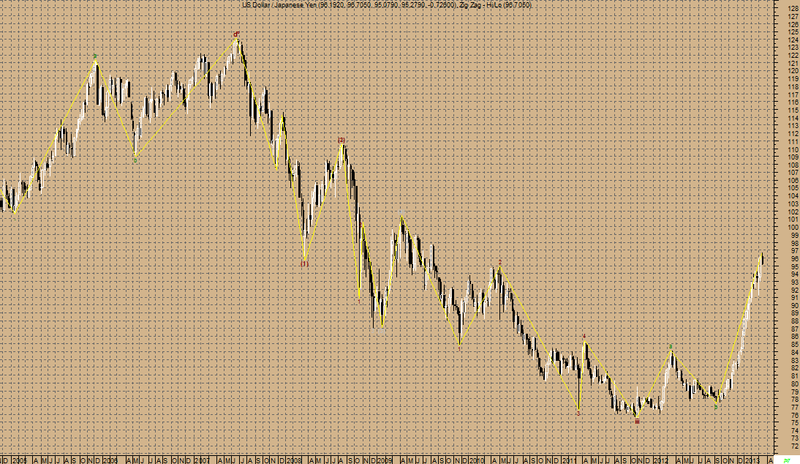 The Nikkei has a long way to go to get to its pre-2008 level. The good news is that the Japanese index has rallied only half the way while a lot of global indexes have hit the pre-recession levels or are just about to. The Nikkei is fully expected to make those gains necessary to hit pre-2008 levels. The April Rate decision is what traders are looking forward to as it will be a platform for Kuroda and his camp to leave a sign of things to come when they do take over. Kuroda wants to turnaround the sluggish Japanese economy quickly. 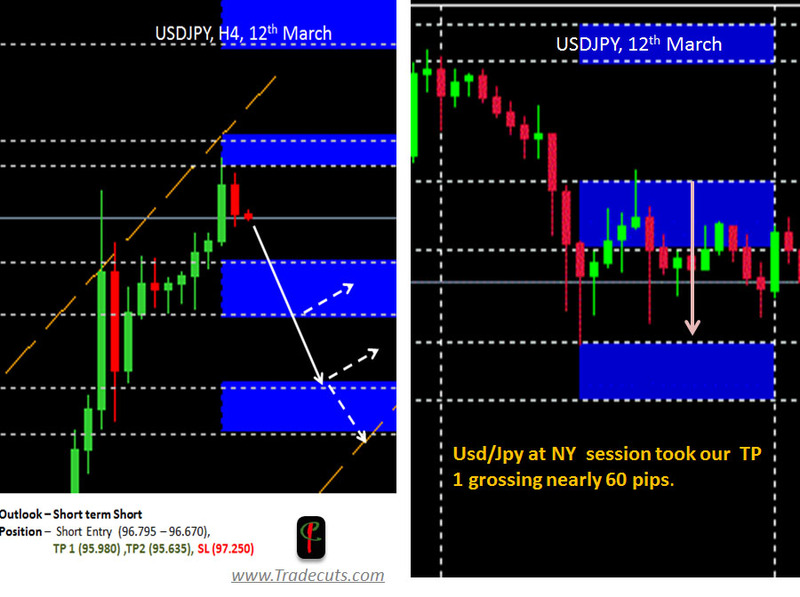 It was a good day for us across all the YEN pairs and in USD/JPY alone we closed with nearly 60 pips profit. Here is a look at our Before & After Chart. US Dollar / Japanese Yen is long term Bullish as the 144 days moving average of 84.36 is increasing. The Relative Strength Index is at 84.70 in the overbought territory. The Relative Momentum Index is at 92.80 in the overbought territory. An important indicator for Elliott waves, the Elliott oscillator is at 8.51, in positive territory; this is a bullish sign. An equally important indicator, the STORSI is at 64.99. This value is in the neutral territory. Would appreciate your comments and feedback.